It is now well over a month since the violence started in Gujarat. As yet there is little sign of it abating. The violence has become so routine that it no more makes headlines. Communal violence is not new to India. Certainly Gujarat has seen much violence over the decades. However, what makes this bout of violence significant and deeply disturbing is that it is no ordinary communal riot. It is anything but a spontaneous reaction to Godhra. The state and police is hand in glove with the perpetrators of this violence. Evidence clearly points to incidents when activists of BJP, RSS, VHP and Bajrang Dal were an active part of marauding mobs. Minority homes and businesses have been specifically nicked out and targeted. Telephone Calls to police and fire brigade have gone unheeded. If even top government functionaries like High Court Judges could not rely on state protection, what could the under-privileged common people expect ? Independent observers have estimated that over 2000 people have lost their lives. 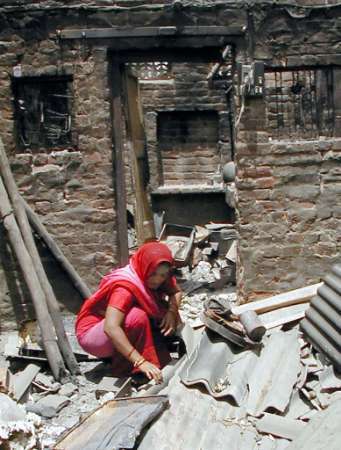 Innumerable homes and businesses, over more than 3,000 mosques and dargahs have been destroyed. About a lakh and a half people have been displaced from their homes and now over one lakh victims are living in makeshift relief camps. In the face of total apathy of the state, there is an immediate necessity to provide some relief – food, medical help and other necessities – to these people. Kalachuvadu, the Tamil bi-monthly of arts and literature, has launched a fund. Apart from providing relief, this fund will also go towards pursuing independent enquiries into the perpetrators of this carnage and bring them to book. The fund will be collected between 15th April and 31st May 2002. The fund will be remitted to ‘Citizens for Justice and Peace’, Mumbai. (Its members include Justice V.R. Krishna Iyer, Justice Suresh, Mr. Anil Thapar, Mr. Vijay Tendulkar, Mr. Alique Padamsee, Mr. Javed Anand). The required permission has been acquired for this. Concerned individuals and organizations are requested to contribute liberally to this fund. Cheques and demand drafts may be made in the name of ‘Kalachuvadu Gujarat Carnage Victims Relief Fund (A/c. No. 01100056031, SBI, Nagercoil). Any enquiries may be addressed to Mr. Kannan, ‘Kalachuvadu’, 669, K.P. Road, Nagercoil 629 001. Tel : 04652 222525 or 98421 23159. Further details may be acquired in Chennai at the following tel. nos. : 4614674 and 4937946.